It was a chance of making history in 4th ODI but South Africa playing in Pink Jersey showed their intention and maintained their record of not losing in the pink dress. India was just about to win the series but a no-ball from Chahal has taken the game away from them. In this post, we will talk about Today Dream11 Fantasy Cricket Prediction of IND Vs SA 5th ODI. I know you might be thinking about the playing condition, pitch report, who will win the toss, best team for dream11 and all the other aspects, tips and tricks to win the fantasy cricket league. If you want to increase the chances of winning then read the full post as winning in dream11 is all about strategy and a bit of astrology, we give pro tips which will help you to get almost 100% success. Who Will Win The 5th ODI between Ind V Sa? 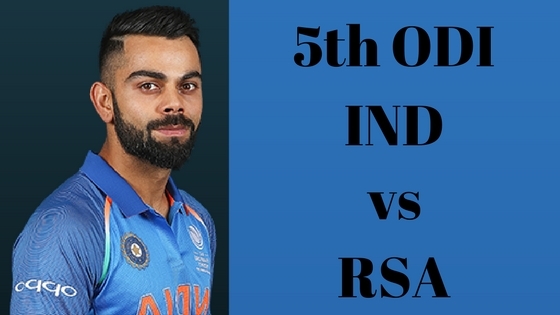 Match: India Tour of South Africa, 2017-18, SA vs IND, 5th ODI. Venue: Port Elizabeth, St. George’s Park. Time: 11: Am GMT, 04:30 pm IST. Average first inning score is 232. Average second inning score is 198. Highest total in this ground was 335/6 in 50 overs by PAK v SA. Lowest total on this ground was 112/10 in 30.1 overs by NZ v AUS. The pitch of St. George’s Park will play slow so it will be difficult for the batsman to play on. As we have mentioned above in the scoring pattern of this ground that average 1st inning score is 232. But it will help the batsman if they don’t lose wickets initially. If we look at the score of the last two domestic matches played here was very disappointing, it was 181 and 167. Although it’s good the for the two spinners of Ind as they both were not that much effective in 4th ODI. Last international match played here was between SA v SL. It was a low scoring match and South Africa easily won the match. 181 was the score proteas has to chase and they chased just losing 2 wickets. Imran Tahir took 3 wickets in that match. Indian team has played 4 games against Proteas in this ground and the most shocking part is Ind have lost all the matches in this field. Believe us you will be surprised to know that Men In Blue have lost a match against Kenya also in this pitch. So guys finger crossed as this ground doesn’t seem to be lucky for India. It is expected that there will be heavy rain at times. In the morning it will be overcast and windy, in afternoon we can see light drizzle and in evening and night patchy rain is possible, so again finger crossed so that we can see the full match. Virat Kohli (c), Shikhar Dhawan, Shardul Thakur, MS Dhoni (wk), Hardik Pandya, Mohammed Shami, Bhuvneshwar Kumar, Rohit Sharma, Yuzvendra Chahal, Kuldeep Yadav, Jasprit Bumrah, Ajinkya Rahane, Axar Patel, Manish Pandey, Dinesh Karthik, Shreyas Iyer, Kedar Jadhav. Aiden Markram (c), AB de Villiers, Khaya Zondo, Morne Morkel, Heinrich Klaasen (wk), David Miller, Jean-Paul Duminy, Tabraiz Shamsi, Kagiso Rabada, Hashim Amla, Imran Tahir, Andile Phehlukwayo, Farhaan Behardien, Chris Morris, Lungisani Ngidi. Bumrah or Bhuvneshwar Kumar, either of the two might have been rested if they would have won the 4th ODI but today Kohli will not take the risk of giving rest. Kedar Jadhav will play in this match. Axar Patel may get the chance to play as the pitch will be slow and Proteas find difficult to play the spin bowlers. Virat Kohli (c), Shikhar Dhawan, MS Dhoni (wk), Hardik Pandya, Bhuvneshwar Kumar, Rohit Sharma, Yuzvendra Chahal, Kuldeep Yadav, Jasprit Bumrah, Ajinkya Rahane,Kedar Jadhav. In Practice, during the nets, SA team were concentrating on spinners and if you listen to Klaasen- he says they have found the key to the spin duo. Either Imran or Tabraiz Shamsi will play. Aiden Markram (c), AB de Villiers, Heinrich Klaasen (wk), David Miller, Jean-Paul Duminy, Kagiso Rabada, Hashim Amla, Chris Morris, Morne Morkel, Andile Phehlukwayo, Imran Tahir. MS Dhoni: Dhoni is just 46 runs short to become the 12th player to reach 10,000 runs in ODI. It will be a proud moment for Indians as he will be the fourth player from India after Sachin, Ganguly and Rahul Dravid.In the last match, Dhoni scored 42 runs off 43 balls. If we see his last four match performances, he contributed with 8.5, 6, 15 and 25.5 points and he was selected by 45.57%, 27.55%, 42.74%, 36.04% and for the fifth match he was selected by 39.2% of the fantasy users. Heinrich Klaasen: Klaasen is also not behind Dhoni, in fact, he is 1 run ahead of him in the last match. His points were 17.5 and 27 in last two games and were selected by 43.36% and 63.96%. 60.8% of the people have selected him for the 5th ODI at the time of writing. Pro Tips: Select Heinrich if you are playing in the small league but if you are going for grand league select MSD as there is a chance that he will come after Kohli to bat and very less dream11 users have selected him. Virat Kohli: No doubt Kohli is in great form and you cannot ignore him. In the last game, he scored 75 runs from 83 balls. If we see his points, it’s just mind-blowing. 71, 28, 102 and 46 were the points which he has contributed in last four matches respectively. He was selected by 88.84%, 88.24%, 90.6%, and 82.4%. For the 5th ODI 85.32% of the dream11 players have selected him. Shikhar Dhawan: This is one of the best series of Dhawan so far from abroad. In the last match, he scored 109 runs in 105 balls, although his innings couldn’t take India on the happier side. 22.5, 34,48, and 67.5 points have been contributed by him. He was selected by 43.89%, 55.66%, 68.09%, and 74.81%. For the fifth match, 78.04% has selected him. Rohit Sharma: As usual in this tournament, he has just scored 5 runs in the last match. His points are not worth to mention but if you want to see his points you can see here. He is selected by 34.53% of the users till evening. AB de Villiers: Player to watch for although he didn’t score according to his potential, he is only a player in RSA who can play spin nicely. He is selected by 73.01% of the users. Aiden Markram: He has shown what he can do in the U-19 world cup, that is why he is captain of SA. He scored 22 runs in the last match. Although he couldn’t contribute many points in the fantasy league, he has been selected by almost 50% of the players in all the matches he played. David Miller: What a life saver no ball it was from Chalal?The last match he scored 39 runs although 39 runs don’t seem too much, it was his innings which took Proteas on the winning side. He is selected by 46.83% of the users. Hashim Amla: Amla and Rohit Sharma both are in the same boat, both of them are not performing but in the last match he scored 33 runs. He is selected by 41.21% of the users. Pro Tips: Make a combination of the team from the above players. In Grand league take Rohit and Amla. Jean-Paul Duminy: Again in the 4th ODI, he took the responsibility of 3rd down but couldn’t convert, he just scored 10 runs. He is selected by 66.66% of the users in today’s match. Andile Phehlukwayo: Phehlukwayo scored 23 runs in 5 balls in the last match. He is selected by 38.21%. Hardik Pandya: Pandya is not contributing too much from bat but he took 1 wicket in the last match and scored just 9 runs. 44.5% have selected him today. Chris Morris: Morris took 1 wicket in the last match. 45.95% have selected him. Pro Tip: Keep Duminy in your team for the small league. If you are playing with more the one team make a combination of players. Pro Tip: Make sure select Kuldeep and Chahal on your team for all the leagues as the pitch will play slow. As the pitch will play slow there is more chance that India will win the game and according to astrology and crix11 expert also India will win the match. India will win the toss and choose to bat first. They will put almost 300 runs on the board and they will win the match by almost 60-80 runs. Conclusion: So Thanks to all the readers of crix11 for reading “Today Dream11 Fantasy Cricket Prediction Of IND Vs SA 5th ODI”. If you have got any suggestion you can comment below.